(Reuters) - Netflix Inc hooked 7 million new streaming subscribers from July to September, a third more than Wall Street had expected, reassuring investors who had worried the company was facing a slowdown in its fast-paced growth. The record number of additions for the period brought Netflix's customer base to 137 million worldwide, making it by far the world's biggest online subscription video service. Its shares, already up about 78 percent so far this year, jumped 14 percent to $394.25 in after-hours trading, helping up some other high-tech stocks. The leap in subscribers - and the company's shares - marks a sharp turnaround from three months ago, when investors sent Netflix shares tumbling 14 percent for missing Wall Street's subscriber growth targets. "The question at the end of Q2 was whether that miss was an aberration or signs of a longer-term slowdown in the business," said Forrester Research analyst Jim Nail. "The answer: an aberration, likely the results of a somewhat low volume of new content last quarter." Netflix's results sent shares of Alphabet Inc, Facebook Inc and Amazon.com Inc up about 1 percent higher in extended trade. The four make up the so-called FANG group of high-growth companies that in recent months has lost some of its momentum following market-leading gains in recent years. Netflix is investing more than $8 billion in entertainment programming this year to lure new customers around the world. In the third quarter, it released its largest slate of original TV shows and movies to date including new seasons of hits such as "Orange is the New Black" and "BoJack Horseman." That paid off in terms of new subscribers. Wall Street analysts had expected Netflix to add about 5.2 million streaming customers in the quarter. The company exceeded forecasts in both U.S. and international markets. Netflix said it signed up roughly 1.1 million subscribers in the United States, above analysts' estimate of 674,000, according to Refinitiv. Its international business added nearly 5.9 million subscribers, compared with the average analyst estimate of 4.5 million. In a letter to shareholders, Netflix said it saw "strong growth broadly across all our markets including Asia." For the current quarter, Netflix forecast it will add 1.8 million customers in the United States and 7.6 million in international markets. "We want to assure investors that we have the same high confidence in the underlying economics as our cash investments in the past," Netflix said in its letter. During the September quarter, Netflix added about 676 hours of original programming in the United States, a 135 percent increase from a year earlier, according to Cowen and Co analysts. Netflix has been borrowing heavily to fund such rapid growth in TV shows and movies. It has issued a net $7.5 billion of bonds in less than three years. "Rising interest rates could make Netflix increasingly vulnerable to higher cost of capital," CFRA research analyst Tuna Amobi said. 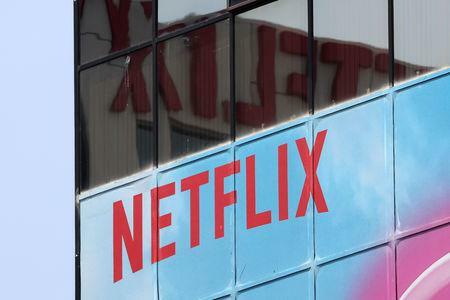 At the same time, Netflix faces competition from deep-pocketed companies such as Amazon and new streaming services from Walt Disney Co and AT&T Inc that are expected late next year. Netflix said it expects operating margins at the lower end of the 10 percent to 11 percent range for the full year 2018. It cut its projection of negative cash flow, saying it would be closer to minus $3 billion in the range of minus $3 billion to minus $4 billion it set last quarter. Netflix's net income rose to $402.8 million, or 89 cents per share, in the third quarter ended Sept. 30, up from $129.6 million, or 29 cents per share, a year earlier. That beat analysts' average estimate of 68 cents, according to Refinitiv. Total revenue rose to $4 billion, in line with analysts' expectations.